Antonio Machín was born in Sagua la Grande, Cuba in 1903. Along with three Puerto Ricans, Daniel Sanchez, Cándido Vicenty, and Plácido Acevedo (from Aguadilla), he formed Cuarteto Machín and recorded in New York starting in 1932. Not sure of the recording date for this record as information regarding these particular sides eluded my internet search results. They were not included in the Cuarteto's list on the UC-Santa Barbara site, Discography of American Historical Recordings. 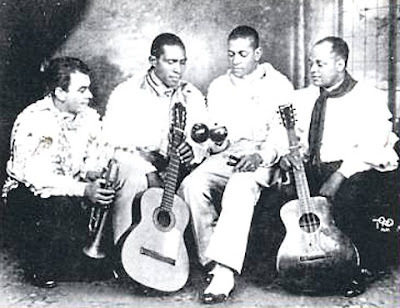 Alfredo Cibelli dir / Félix Ganuza t / Antonio Machín leader / Raúl trés / Daniel Sánchez g.
Recorded in New York on March 1, 1934. The recording date for both is March 1, 1934.